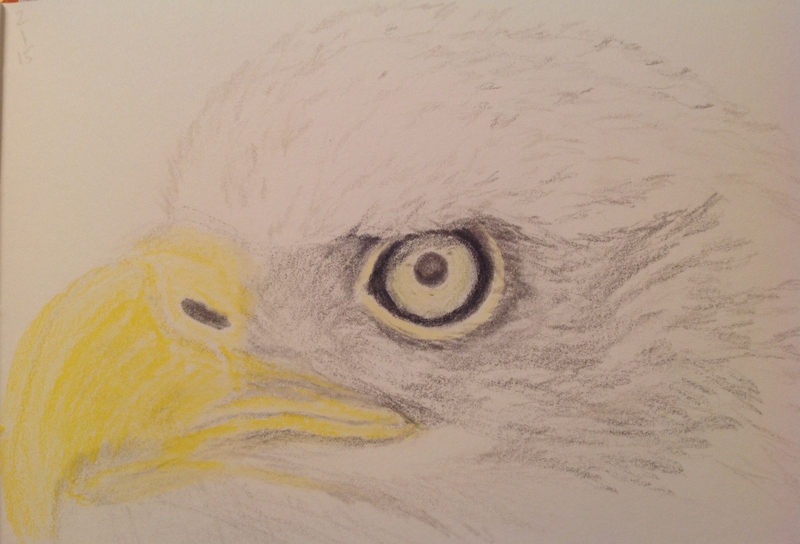 I’d originally planned to draw the eagle eye only….and just kept going with it. Raptors are so intense! You can get completely lost in their eyes. I’ve seen bald eagles in person (though not this close-up, unless you count caged ones), and it really is true what John Denver sings: “He knows he’d be a poorer man if he never saw an eagle fly”. Nature enriches our lives in so many ways. I couldn’t get the yellow of the beak just right, and admittedly, didn’t really take lots of time to layer yellows and oranges either. If I try this one again, I’ll definitely block out more time to do it. I think this one took me by surprise, and if I had not been working in my 3×5″ sketch book and run out of room, who knows what I’d have wound up with. I’m still taking requests, so if you have a favorite bird, flower or animal, please let me know, and I’ll try and get to it soon. At this point, I’m not married to my tentative I and J choice, and K, L, N through Q and S through V are open. Tomorrow I have a bit of a landscape piece planned to change things up a bit. Hope to see you then! Really good. I learned a thing or two from how you did the eye. Funny that the first thing I noticed was the penetrating eye before I even read your post. They eye speaks a thousand words and draws me in intensely! Thanks, Jodi! I am so drawn to the eye of pretty much everything I draw. I agree, this one in particular is so intense!! This is so cool. Especially the eye, very intense. Thank you so much, Rachel. It’s good to hear from you! This is a remarkable shot of the Eagle’s face and eye. You’ve really captured the intensity of the “look” that one always sees in eagle photos! Thank you! I wish I’d have known the photographer. I’d have been able to credit him/her and post the photo. Often, I don’t, but their (your) work is so helpful to artists!